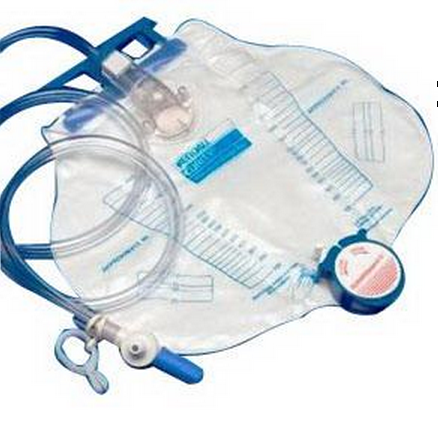 Dover Urine Bedside Drainage Bags 2000cc, formally known as Covidien Dover™ Urine Drainage bag, is now manufactured by Medtronic, are convenient, easy-to-use and high volume capacity. These drainage bags come with a universal hanging device and feature easy-to-read graduations. How long you keep each bag in use is up to your discretion as there is no professional recommendation for how long to use them. To get the most out of each bag, be sure to choose a deodorizer like the Adapt Lubricating Deodorant, which lubricates the inside of the bag and helps to keep it fresh and stain-free; or an appliance cleanser like Alpine Fresh Ostomy Appliance Cleaner, which thoroughly disinfects while deodorizing. Optional drainage and anti-reflux devices are available, including a splash resistant drain spout (SplashGuard II) and a MONO-FLO Anti-Reflux Device. The Bedside Drainage Bags have a large diameter vertical drip chamber with a closed system aspirating port on the tubing that permits repeated fresh urine sampling. Drainage Bag Tubing is 11/32 Inch diameter for better urine flow. Used For Collection of Urine. Emptying of urine in the plastic tube into the bag seems slow. Is the valve designed that way ? The valve is designed for emptying and ensuring a proper seal. The product quality is excellent, and service was amazingly fast. I did not receive this item. I received 3 different orders of overnight bags that did not match this order, and was billed for items which were not the items sent or ordered. While all bags might be useful in a hospital, these bags sent were either too large, too lengthy tubing, or too clumsy for personal home use. Excellent product. I have been using it for three years and have had no problems. Excellent and swift service, quality product, highly recommend this resource. I take care of my husband at home and purchase these bags on my own because the ease of use is superior than any other I had been given to use. Have been using the Dover Drainage Bag for 8 years. My provider can no longer cary this item. The tubing is flexible enough for me to turn at night without kinks or problems. First class shopping experience! I am not only pleased with the Curity bedside drainage bags performance, but the super fast shipping from Vitality Medical! I bought 5 bags but will be needing more soon, and I see no reason to shop from any other company. Truly satisfied! Easy to use with flexible neck for hanging from bedrail. Will purchase again. Bag Changed not for the better! changed design not for the better. beefed up the hanger but attached to bag very poorly. Not for sure if exclusively for vitality medical or all vendors. Bags were resonably priced and recieved quickly. Job well done.